JAVA has rich set of libraries which are used for creating Graphical User Interface in platform independent way. 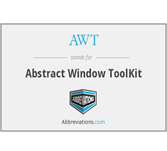 In this chapter, we will discuss about AWT (Abstract Window Toolkit). This tutorial is useful for Software Professionals who wish to learn JAVA GUI Programming. This tutorial will give good understanding on JAVA GUI Programming concepts. After completing this tutorial, you will get medium level of expertise and later you can attain higher level of expertise. Before learning AWT, users should have a basic knowledge of Java programming language, text editor and execution of programs etc.